A passenger train consisting of 10 railcars, which will run on the Baku-Ankara-Baku route along the Baku-Tbilisi-Kars (BTK) railway, has been delivered to Turkey, Trend reports via Kars Manset. 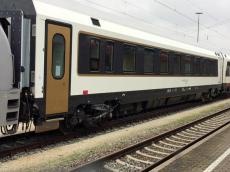 The railcars of the Swiss company Stadler were delivered to Turkey within six days. The train, which will run on the Baku-Ankara route at night, consists of nine sleeping cars and one dining car. The railcars will be attached to the locomotive and delivered to Azerbaijan. Baku-Ankara-Baku route will start operating from the end of 2019. The BTK railway started to carry out cargo transportation in 2017.